IN WINE circles, knowledgeable tipplers get excited about the concept of "terroir". This is a French word meaning soil or earth, and it encompasses the idea that where a grape is grown will affect the characteristics of the final wine product. To some extent, beer styles were developed to reflect the local conditions, available ingredients and intended use in their respective regions as well. Don't have good barley - make beer out of wheat; when it is cold outside, make heavy dark beers that warm the cockles of your heart; stinking hot outside, enjoy a crisp and clean lager - horses for courses as they say. India Pale Ale, as an example, was made with more alcohol and hops to ensure it was drinkable after the long and hot sea voyage from the Old Dart to India. Likewise, the venerable Guinness Brewery, as it began to export its popular bevvies around the world, added more hops to their standard porter to keep it drinkable after the journey across the Atlantic to the West Indies. 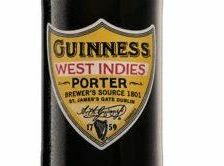 Guinness claims its latest release, West Indies Porter, is inspired by a recipe developed in 1801 and modified to take advantage of the advances in brewing technology. Hugh the Neighbour and I sat down to try a couple last weekend and it would be fair enough to say that where we were sitting was a fair bit warmer than the banks of the Liffey in Dublin where the beer was developed, so we had the bottles a bit cooler than you probably should. Didn't really matter though, as this beer delivers on many levels. HTN 'fessed up to having a sneaky Tooheys Old watching the football before I got over there, and he said his first impression was one of bitterness. This soon faded, though, as the maltiness and more complex chocolatey notes began to come through as he drank more of it and the beer warmed up a bit. At 6% alcohol content, it is a big beer - I didn't think it was particularly bitter and certainly nowhere near the mouth-puckering punch of some stouts. It may be a little hard to find - it is a limited release - but I must say I really enjoyed it.